My dad had Fleming’s on his “to try” list for years. We visited the unparalleled steakhouse for his birthday and left total converts. Start at the bar, so you can enjoy an Extra Dirty Martini with Blue Cheese-stuffed Olives and some of their homemade Salt and Vinegar Kettle Chips - one crunch is truly not enough. The Wedge. More like, the leaning tower of Bacon. Garlic Bread is served with Sun-Dried Tomato Butter and Mascarpone Gorgonzola Butter. The latter is perfection; they should sell it as a body cream. It’s ridiculous to not splurge on the limited-time $40 promotion, since a Filet alone is typically $41. 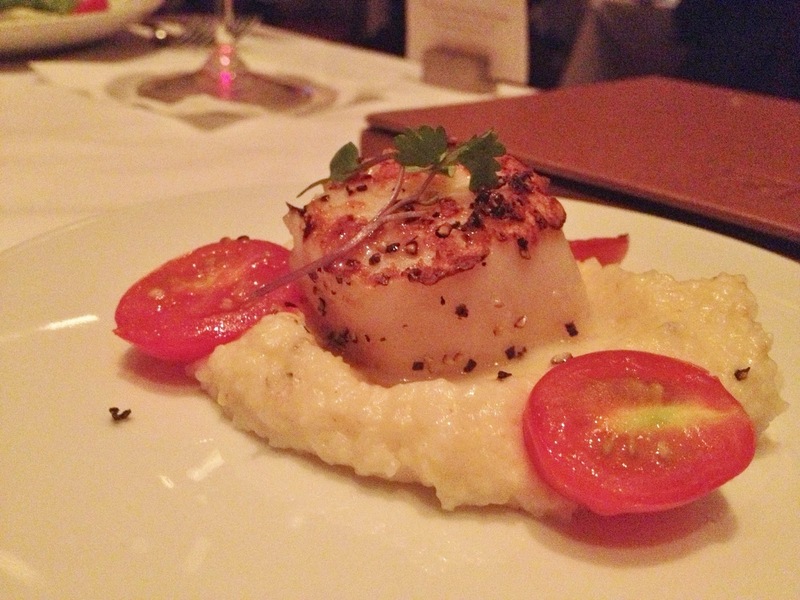 The first course sets the bar high – a buttery scallop served on a bed of Goat Cheese Polenta with tender Cherry Tomatoes. 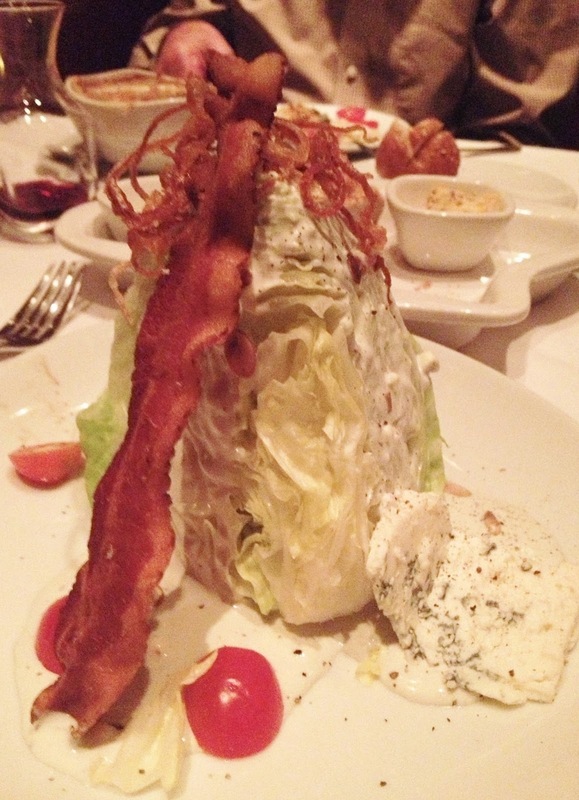 The Wedge is more like the leaning tower of Bacon, with Crispy Fried Onions, Sliced Blue Cheese, Tomatoes and Pine Nuts. French Onion Soup possesses a yummy Sherry flavor, full of onions, Gruyere and toasted Crostini. You could stop here and be totally satisfied, but the main event was around the corner. The Petite Filet with Lobster Tail is about as decadent as you can get. A saucer with melted butter is available, if you choose to take things OTT (over the top). The cracked Peppercorn and salted crust on the filet is fantastic. Spread some of the Mascarpone Gorgonzola Butter on top. Yowza! The Chocolate Lava Cake seemed most appropriate for a night of celebrations and indulgences. The brownie-like exterior and brownie batter-like interior just screams to be mixed with Vanilla Ice Cream and Chantilly Cream. Raspberries add a nice acidity and color. The Pistachio Cookie is reminiscent of a savory shortbread, and is better than a spoon to get every last bite of melted goodness. If you go for your birthday, you’ll leave with a box of four Chocolate Truffles. Fleming’s seriously takes care of their customers. This is most definitely a splurge, but you get what you pay for. You’ll leave feeling like very satiated royals.